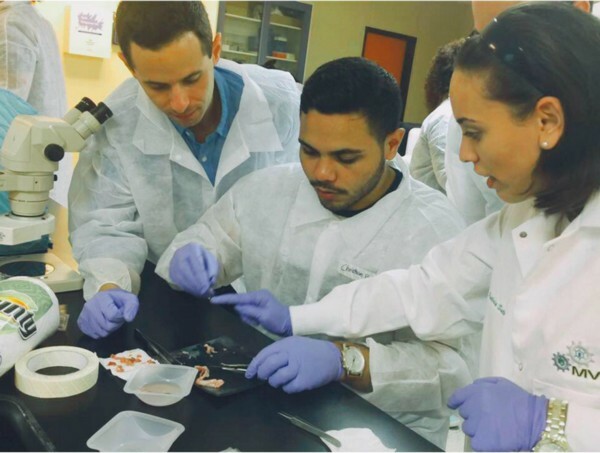 Benjamin Freedman, a graduate student and NSF fellow in the Department of Bioengineering and member of the McKay Orthopaedic Research Laboratoriesin the Perelman School of Medicine, recently spent some time as visiting junior scientist at the University of Puerto Rico Mayagüez. His trip was part of a Howard Hughes Medical Institute program that provides outreach and support to research institutions that predominantly serve groups underrepresented in STEM fields. Working with Bioengineering’s Louis Soslowsky, Fairhill Professor of Orthopaedic Surgery, Freedman studies the way that the tendons in our ankles and knees withstand stress — or fail, leading to serious injury. He’s recently published research on how hormonal differences might help explain why men are much more likely to tear their Achilles tendons than women, as well as factors that influence recovery time after nonsurgical treatment of those injuries. Freedman’s trip involved teaching a hands-on workshop to UPRM students about some of these concepts and learning about their work, too. Active in STEM outreach and mentorship since his days as an undergrad at the University of Rochester, he believes this kind of experience should be a standard part of training for all researchers. In August, I flew to Mayagüez, Puerto Rico, a city of about 90,000 on the west coast of the island. There, I met many students at the UPRM campus. 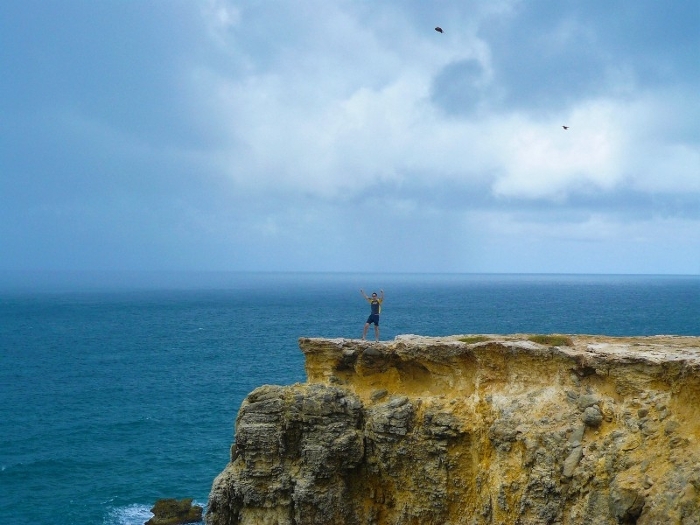 We traveled to magnificent beaches, visited historic sites in San Juan, and experienced PR culture and cuisine. Within a couple of hours, the Spanish language I had once learned in middle and high school began to return to my dialogue, and I quickly became a huge fan of the many varieties of plantains I was able to eat. I came to Mayagüez to share my passion for biomechanics, the study of mechanics (a branch of physics involving the action of forces) relating to the movement and structure of living organisms, through a program funded by the Howard Hughes Medical Institute. This program brings researchers from the United States to educational institutions serving URM students in science to provide advanced research opportunities for undergraduates with the objective of preparing students to further succeed in STEM graduate fields. Growing up, I was always fascinated by the movement of the human body and was later introduced to the field of biomechanics while I studied biomedical engineering during my undergraduate years. There, I became involved in biomechanics research, which includes studying the motion of joints and testing the strength of biological materials (e.g., bones and tendons). The workshop I led was motivated by the mechanical testing of biomaterials, which is very important for understanding their function and utility in biomedical applications. In the workshop, we measured and compared the mechanical properties of materials with various structures. First, we measured the mechanical properties — such as stiffness and strength — of non-biological materials, including plastics and metals to get students familiar with using our mechanical testing device. Then, we measured the mechanical properties of both biological materials and scaffolds and compared the results for various groups. One of the take home lessons was for students to gain a better understanding of how to characterize biomaterials and how material structure can influence mechanical properties. In particular, students thought critically about their hypotheses regarding material strength, performed dissection on soft tissues, mechanically tested specimens, and analyzed collected data. My trip to Puerto Rico also included time to discuss career and professional development with UPRM students. My trip was not just about teaching, however — I was learning, too. We all come from different walks of life and are born into different environments that can affect the paths we take and people we interact with. A career in science is not an easy one, and the barriers to entry are high. At a university like Penn, we often take for granted how fortunate we are to have grant funding to facilitate our science, guest speakers nearby to inspire us, and mentors to help us transition to the next phase of our careers. Although there are many great resources at UPRM, students have to work harder to highlight their achievements to be extra competitive for opportunities within the United States. As a result, students often pursue competitive research internships and experiences at top institutions in the US. The net result is a student body with extremely diverse skillset and knowledge base, one that every school should strive for. Achieving diversity in science is an essential feature of being able to solve tomorrow’s problems and having different perspectives and backgrounds results in more thorough preparation and better solutions. On a professional level, the program was a great experience for developing my teaching and mentoring skills, as well as establishing collaborations that could help me progress in my own research. This experience has motivated me to further get involved in teaching, STEM-outreach, and increasing diversity at U.S. research institutions. For me, this visit was an invaluable experience: Understanding people from different backgrounds with different perspectives will help me to be a better and more effective mentor. I hope that this type of training, where doctoral students visit another institution for a short period of time to lead a workshop, experience a new culture, and interact with students, can become a standard part of the Ph.D. process. I am so thankful for this opportunity. This news story was originally published by the University of Pennsylvania. The full article can be found here.